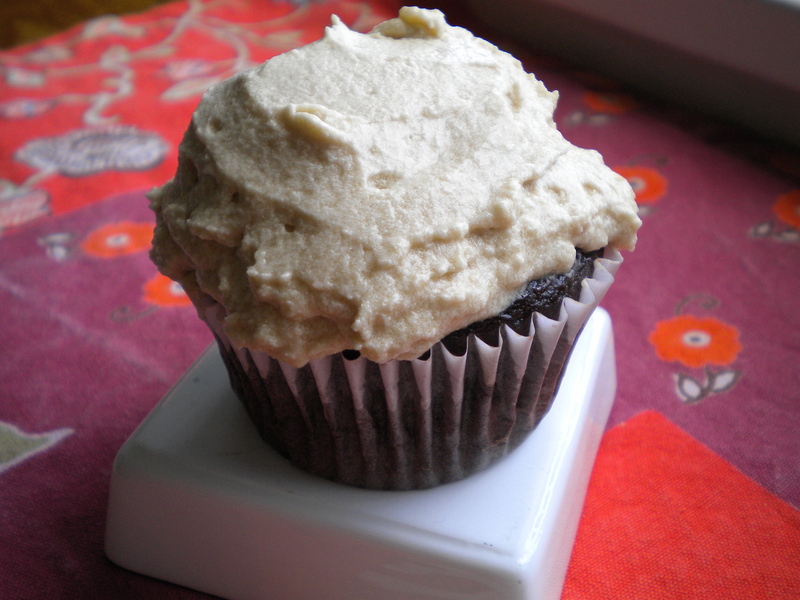 Chocolate Kahlua Cupcakes – Voila! Calling all kahlua lovers! Do you love kahlua in your hot chocolate? Do you love chocolate cupcakes? Wouldn’t you love to combine two amazing flavors into one flavorful blast? If you answered yes to at least one of these questions — then this recipe is for you! (Apologies for infomercial nature of this post.) For all of those who doubt the combination of alcohol and chocolate, here is one more example of why you are just wrong. Sorry. So when it’s too hot for hot chocolate but you’re missing that kahlua taste, make these little delights and consider yourself satisfied. Preheat the oven to 350. Line standard cupcake pans with paper liners. 1. In a large mixing bowl combine the cocoa powder, espresso powder, flour, sugar, baking soda, baking powder and salt; whisk well to blend. 2. Add the eggs, warm water, buttermilk, vegetable oil, kahlua and vanilla extract to the bowl with the dry ingredients and whisk until smooth, 2-3 minutes, scraping down the sides of the bowl as needed. 3. Divide the batter evenly between the prepared cupcake liners, filling about 2/3 full. 4. Bake until the tops spring back when pressed lightly, about 18-20 minutes. Let cool in the pan 5-10 minutes, then transfer to a wire rack. Poke a few holes in the top of each cupcake with the tines of a fork and brush with extra Kahlua while still warm. Allow to cool completely. 1. Beat the butter in the bowl of an electric mixer until smooth and fluffy, about 2 minutes. 2. Mix in the confectioners’ sugar until incorporated. Add in the Kahlua and beat on medium speed until well blended. Add in the heavy cream and beat on medium-high speed for about 4 minutes, until light and fluffy. Frost cooled cupcakes as desired. NOTE: If you’re making these a day ahead, wait to frost the cupcakes. Store the cupcakes on a plate wrapped with saran at room temperature. Store frosting in bowl or tupperware, covered, overnight.